is this not the cutest thing you've ever seen? after two days in a pen bonding with their mama, dakota and delaware got to come out for their first romp in the pasture today. mama amelia was hungry for some green food, so she got right to business grazing. the lambikins followed her closely and tried out their sproinging in all this newfound space. i'm sleepy, too, so i think i'll call it a night. 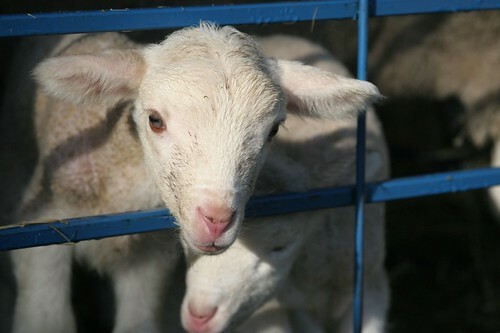 as always, many more new photos have been uploaded to the sheep camp set on my flickr page. 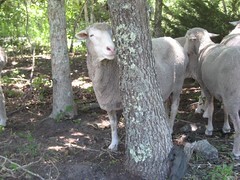 those are the book ends here at the martha's vineyard fiber farm and there is a lot of hard work in between. 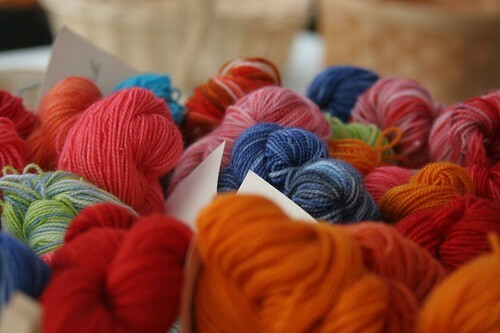 we went to sell yarn at the west tisbury farmer's market today. 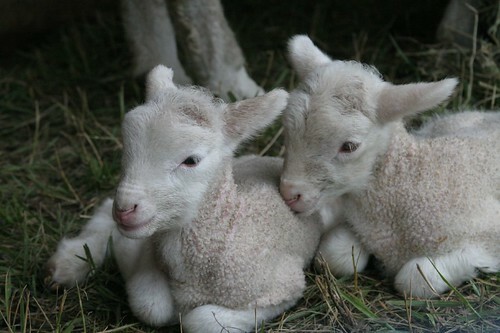 i've added some new lamb pictures and some pictures of the farmer's market to my flickr sheep camp set. 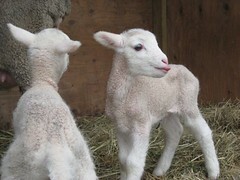 well, there are now two more sheep on the farm when i arrived! 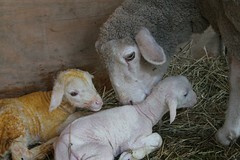 amelia the ewe had twin lambs this evening - dakota (l) and delaware (r). 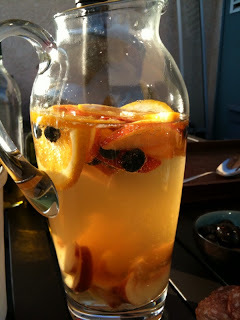 check out more of the photos on my flickr page: http://www.flickr.com/photos/lornababy/sets/72157620926913341/. 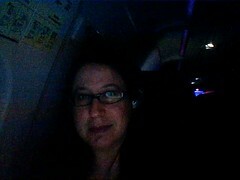 so, here i am on the plane. my flight has internet access, so i was able to upload this picture from my seat, update my facebook, send tweets and check up on my blogs. i think i'll stream a movie on my netflix next. and how cool is that? i love virgin america. i've also been chatting with daven on im. he is chatting from the gmail app on his iphone while watching fireworks from outside the coliseum. i'm 30,000 feet above the ground in a flying contraption and, yet, somehow, i think i'm safer than he is right now. my flight took off at 9pm and it's a gorgeous clear night so i got to see quite a few fireworks over the l.a. area: some big, official displays and quite a few, not-so-legal backyard displays. the backyard displays looked like little strobe lights or flash bulbs all over the city. i can't imagine what it would look like if fireworks were legal in los angeles! quite a cool sight. 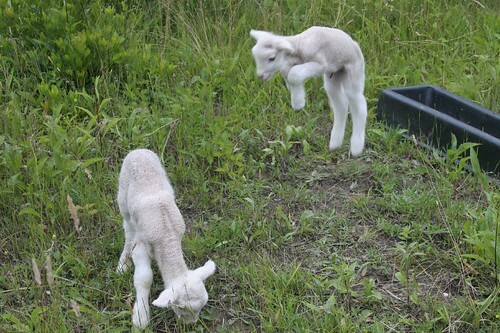 anyway, i'm finally off on my big sheep camp adventure. first stop is a day in boston, though. i arrive first thing in the morning and i figure i'll hit quincy market for some breakfast and then kick around town and see some of the sights. anyone with any tourist tips, send me a message please. then, around midday, i'm catching the train out to the suburbs to meet my blog friend jeff and his wife, steph, and baby, tom. this is my first blog meet up, so i'll admit to being a bit excited to meet someone i've become friends with online but have never actually spoken to. jeff is a cool monkay that also has a food blog (i should say "used to have," since he updates it less than we update ours), which is how we got to know each other. so, we're going to throw down a little bbq and then post it on our respective food blogs! after dinner, it's back on the train to downtown boston and a night in a kimpton hotel (a little splurge). monday morning, i'm up early to catch a bus to woods hole, which is where the ferry to martha's vineyard leaves from. a 45 minute ferry trip and i'm on the island and hopefully being introduced to sheep right quick. 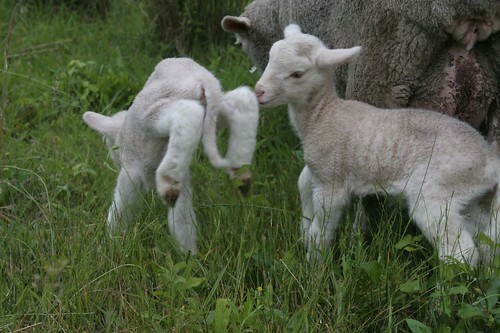 i'll be spending a week with the good folks and animals at the martha's vineyard fiber farm. rumor has it the obamas are going to be vacationing on martha's vineyard in july, so here's hoping our trips will overlap and i can catch a glimpse of the first family. even if we're at opposite ends of the island, i think i'll be closer to obama than i was on inaguration day from my perch at the base of the washington monument! that's it for now. as my dear aunt would say, stay tuna'd. i hope to be posting photos and updates frequently.